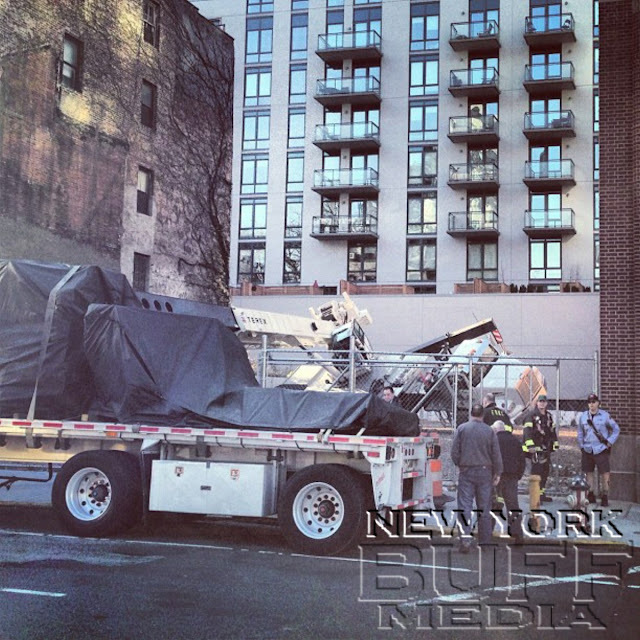 Hells Kitchen - A construction crane collapsed across a busy Manhattan street Monday and landed on a flatbed truck loaded with huge air conditioners. The crane was lifting the heavy air-conditioning units at 438 W. 38th St. in Hells Kitchen when the huge boom suddenly gave way and crashed down on top of the truck. The position of the truck prevented the boom from hitting traffic. No one was hurt. After the accident, the block was closed to vehicles between Ninth and 10th avenues as the boom hung suspended over the street. “It sounded like an earthquake,” said Danny Brown, 51, the driver of the truck, who was unhurt in the freak accident. “It shook the whole area." Brown said the crane operator had hooked the cable of his crane to one of the big AC units and was beginning to lift it when the boom suddenly crashed down. it can be genuinely enormous influences on readers we respect the actual publishing expertise from the article writer.